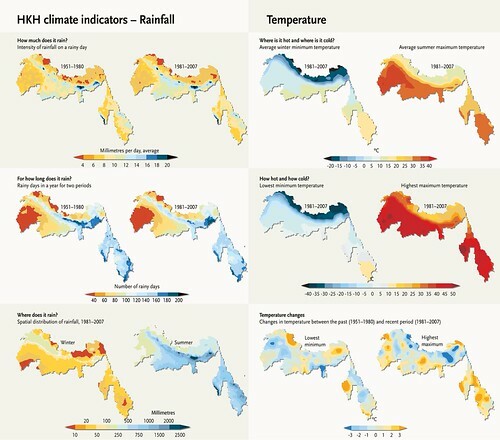 The average annual rainfall over the HKH region (5 basins studied here) is approximately 880 mm, with variability of just 5% between years and high spatial variability. The highest rainfall amounts, accounting for more than 70% of the annual total, are received during the summer months with July being the wettest month. The pre-monsoon season receives approximately 16% of the annual total, with only 5% of annual precipitation falling in winter. December and January receive the least precipitation. On average, there are over 215 rainy days per year. There is considerable variation in the distribution of precipitation across the HKH region. Generally, precipitation is lower in the west than in the east, and lower in the north than in the south. The Tibetan plateau and the southern plains of the Indus basin are much dryer than the southeast. Over the past decades, increased monsoon precipitation has been observed over the high mountain belt of the Himalayas, particularly in the east. The greatest decrease in monsoon rainfall has been observed in the south in the Ganges and Indus basins. Seasonal changes are also being observed: winters are getting wetter over most of the central and southern portions of the five basins, and winter precipitation is decreasing over the northern areas of the five basins. While the number of extreme rainfall events appears to be decreasing, the intensity of each event (amount of rainfall) appears to be increasing, especially towards the western parts of the HKH. In summary, over the last few decades and across the region there has been no discernible trend (increase or decrease) in the amount of rainfall, although there has been considerable year-to-year variability.